A few days ago, Snack Girl received a request for a recipe for cranberry sauce. Yes, I take requests. I have attended a Thanksgiving where a gelatinous can-shaped thing arrived at the table and it was dubbed “cranberry sauce”. Oh no. You see, I am a cranberry sauce snob. I learned that all you have to do is the recipe below and you have mind-blowing cranberry sauce. It is so simple and almost as easy as opening a can and plopping said purplish goop in a bowl. Believe me. Fresh cranberries can be found EVERYWHERE right now in your produce section. Yes, they might set you back $3 but your family and friends will applaud when you serve this. Above in the photo is my pot of cranberry sauce bubbling away for all of 10 minutes. At the stage in the photo, the berries are just about to pop. I mix in ground cinnamon and ground ginger because I am super lazy (do not want to peel ginger or buy cinnamon sticks). I shake in about ½ teaspoon each until I like the flavor. The sauce firms up in the fridge and looks beautiful when served in a bowl (unlike the other stuff). Do you make fresh cranberry sauce? How do you make it? Wash cranberries and check for duds. In a saucepan, mix sugar, water, and cranberries. Bring to a boil, and then reduce heat and simmer for 10 minutes or until cranberries burst. Add optional ingredients and then chill in refrigerator. I've made a few different versions of this and love it more than anything. I often dream about it throughout the year. That stuff in the can doesn't hold a candle to this one. It just keeps getting better and you will want your Turkey Day leftovers even more! I have also made this but used Splenda instead of the sugar. Everyone loves it and 0 WW PP for 1/4 cup! Bit suprised you are offering the hungry girl cook book. She is great in cutting calories but uses a lot of processed foods. I s healthy eating not to eat as less as possible processed foods? Love fresh cranberry sauce. Picked 20 lbs myself this year. You can freeze them whole and use them the rest of the year. Ialso have a batch of cranberry wine brewing. For healthier version I am going to try organic cane sugar, some stevia so I can cut back on sugar, and chia seeds to thicken a bit and makes it thicker. What do "duds" look like? Not a cook, can you tell. I've made fresh cranberry sauce for decades. I usually use 16 oz, (1 lb.). Also, if you feel the bubbling mixture is too foamy, plop in 1/4 tsp. butter or margarine. Mary W. -- "duds" are berries that look too squishy; pale ones are fine to use. I usually have a recycled large glass jar ready, sitting on the counter with very hot water in it. Dump the water out, pour sauce in and close with lid and the sauce will stay good in your refridge for a VERY long time -- it must be so high in acid I have never had mold or had to throw it out. Thank you Snack Girl for this receipe. I love the picture too. I will definitely be making this. I have one question. How long will this cranberry sauce last in the fridge? I just might not be able to wait until Thanksgiving to try this out. I put a jar of orange marmalade and a cup of raisins in mine. It's almost like a chutney! I also slice some apple into the cranberries while cooking. And just this year, I got adventurous and added the really dry apricots. Definitely a different taste and those apricots puffed up into a delicious squishy chew. :-) Thickened the sauce also for some reason. 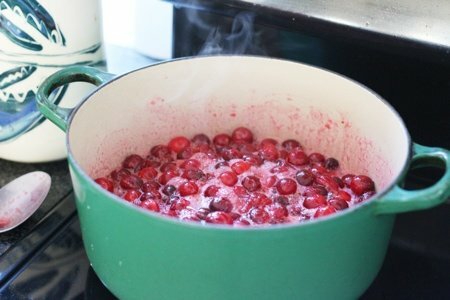 I too use Splenda and make this about 3xwk since I can eat this "relish" as a dessert easily during fresh cranberry season! Here is another tip - fresh cranberries are only available now, and since cranberry sauce is part of our Easter and New Year's day meals, buy extra now and freeze them! Otherwise, it is the canned stuff that is all you can get! I've made this for years and will never eat canned again. Made with Splenda last year. This year will try Domino Light sugar and stevia blend. I eat way more than 2 tbsp it's so good! We have always done the version on the bag of Ocean Spray cranberries - I don't know the proportions off the top of my head, but you grind up cranberries, sugar, and oranges in the food processor. Delish! Your recipe sounds good too. You can use this same recipe but instead bake in the oven in a 9X13 pan for about 30 min. until berries puff up and sugar is dissolved (stir once or twice). Adding a little orange juice works great but 1/4 cup of Brandy is even better! You can use leftovers (if there are any) to make an oatmeal square with cranberries in the middle of layers of oatmeal crust and topping. Yum. I love that recipe and make it sugar free with either Splenda or stevia. No one misses the sugar. I have made homemade forever, jellied stuff is worst thing on earth. I always have bags in freezer. Also use stevia to cut sugar. Make it all year cuz I love it in my morning oatmeal. I make acranberry relish. In a food processor, process 1 pound fresh (or frozen) cranberries, 1 whole apple, and 1 orange. You can quarter the apple and orange, but don't bother coring the apple and certainly don't peel the orange. Process until chunky. Add sugar/honey/sweetener if you feel it is too tart. Make it even more fun by adding 1 or 2 jalapenoes to the processor. Big interest in cranberry - my mom always makes a recipe like this, plus the cran/orange relish - YUM! but... I still need to bring a can of the jelly for my "picky" husband - he doesn't know what he's missing! Like all the suggestions - may have to make some for myself & keep in the fridge!